Universal’s Islands of Adventure draws its inspiration from a number of different sources with cutting edge entertainment including a number of world class roller coasters and high-tech motion simulators. It continues to lead the way with some of the most thrilling theme park rides in all of Florida. It opened in 1999 and compliments its next door neighbour Universal Studios Florida. If you want to park hop then it really is just a hop, skip and a jump between the two parks; a five to ten minute walk from the main entrance or the newly opened Hogwarts “Express” train ride between the two Harry Potter inspired lands. 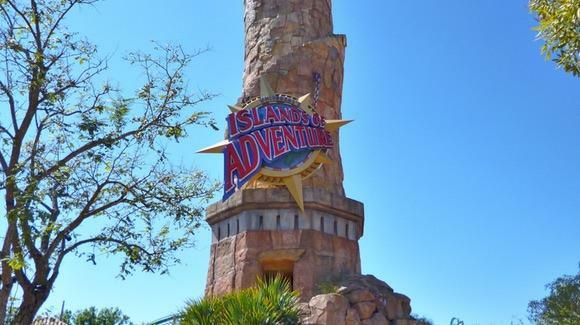 Islands of Adventure consists of seven interconnected islands plus an entrance area located around a central lake, the Great Inland Sea. The layout means that each island is quite distinct with its own theming and background music. Seuss Landing - aimed at children including an interactive play area If I Ran The Zoo, The Cat In The Hat: Ride Inside and the High In The Sky Seuss Trolley Train Ride! If you are looking for a non water park to get very wet in, then Islands of Adventure is the one with three very wet rides, Jurassic Park River Adventure, Dudley Do-Right’s Ripsaw Falls and Popeye & Bluto’s Bilge-Rat Barges. Whilst Islands of Adventure does not have any parades, there are meet-and-greet opportunities, particularly with some of the Marvel characters on the streets of Marvel Super Hero Island. Like Universal Studios Florida, Islands of Adventure also offers a range of full table service and fast-food quick self service restaurants plus seasonal kiosks dotted throughout the park. Mythos is probably one of the best full service restaurants you’ll find in any of Florida’s theme parks. Throughout the park you will find merchandising relevant to the area you are currently in plus the large Islands of Adventure Trading Company at the front entrance. You can buy single day or multi-day park tickets to Universal’s Islands of Adventure with or without the option to park hop to Universal Studios Florida. To reach Islands of Adventure, you park in the multi-level parking garage. Moving sidewalks lead you to the Central hub. From here, you pass through the CityWalk entertainment area and then continue straight ahead is Islands of Adventure. If instead you turn sharp right you enter Universal Studios Florida, Universal’s other theme park.